Michael Macoun has written a fascinating account of his life in many lands and of his career from unwitting, but successful, smuggler to Inspector-General of Police in the Colonial Service and later still Police Adviser/Inspector-General of Police, Dependent Territories in the ECO. He writes only briefly of his early days in China, of School at Stowe and then at Oxford and of his travels in pre-war Europe in 1938. He then started his long career in the Colonial Police Service, which took him to many overseas countries, particularly in Africa, and won him so much respect. His knowledge of German, picked up on his travels on vacation from Oxford, led to his first appointment in Tanganyika, once a German territory and still the home in 1939 of more Germans than British. Apart from a couple of years during the war when he was seconded to the Combined Services Security Bureau in Nairobi to be part of the Intelligence Agency in the East Africa Command, he was to remain in Tanganyika for eighteen years and was Acting Commissioner of Police before transferring to Uganda in 1959 as Commissioner of Police. 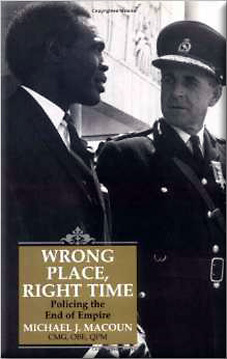 The very readable account of events in Uganda in the period 1959-1964 as Uganda moved towards independence and of the problems of the first two years after it was achieved, which he described as the years of turmoil, shows that his willingness to listen to people of all races was all important. His assessment that independence would come much sooner than most people in government at the time thought likely encouraged him to set in motion a review of the steps necessary to enable Uganda African Officers in the Police to accept greater responsibility and assume genuine command duties on the coming of Independence. He gives a gripping account of events in Uganda both prior to Independence and of the immediate years following. Macoun's picture of Uganda's problems at that time shows, with no arrogance, his early appreciation of the coming problems and of the action necessary to resolve them peacefully and of his ability to meet people of all races to discuss coming events with patience and firmness and to earn their respect as an honest representative of the colonial system whom they could trust. When he left Uganda in 1965 he undertook a lecture tour of the USA, followed by six months as a lecturer at the National Police Staff College at Bramshill. Hearing of a vacancy for the post of Deputy Inspector-General of Police in the Colonial Office he applied and was appointed from 1 April 1966. After 12 months he was promoted to Inspector-General, and as the Colonial Office merged with the ECO so his title was changed to Overseas Police Adviser/Inspector General of Police, Dependent Territories - a post which was to take him to 78 countries in the following years. He was adviser on Police Training to ODA and found himself one of the UK delegates at 12 Interpol Conferences. He was also called on to be available at short notice to areas of "incipient disorder", which led to still more overseas safaris. Einally the book has seven appendices providing details of some of the earlier chapters. I found Wrong Place, Right Time very interesting reading and a source of fascinating information about events of interest and Michael Macoun's actions to restore order. Those who were in the territories in which he worked or visited and especially all those who are interested in the work of the police established by Britain overseas, should find it well worth ordering.